The settlement at Berkswell probably dates from late Anglo-Saxon times. The South part of Warwickshire was ruled by the Hwicce, a Saxon people who had moved Northwards from the Thames. The North and East of Warwickshire (including the area of Berkswell) was ruled by the South Mercians, Angles, who had moved Southwards from the Trent. Berkswell takes its name from Berculs-well. Bercul was a Anglian chieftain. Our modern perception of the word "well" is a deep hole bored in the ground, but this was not its original meaning. The word originally meant a strong bubbling spring, as in Berculs-well. The word "well" comes from a Sanskrit root, and is related to several other words containing "w-l" or "v-l", which all have the meaning of force or movement: will, volition, re-volve, bene-vol-ent. The word "spring" also had an original sense of "bursting forth". The season of the year, Spring, has the same name, for the same reason. This is the probable origin of ancient religious associations with the spring at Berkswell. 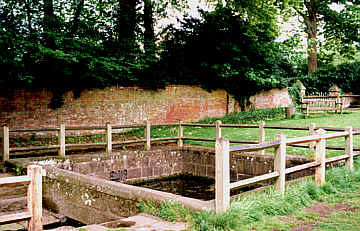 The spring now issues into a stone tank shown at the left, which then flows into the river Blythe. It is believed that the well was originally dedicated to an Anglo-Saxon God, and an ancient round stone which is preserved in the nearby Church may have supported a statue of the God. This is the village green, with, at the right, the village shop, and in the background, at the end of the lane, Berkswell Church. The well lies just to the left of this picture. 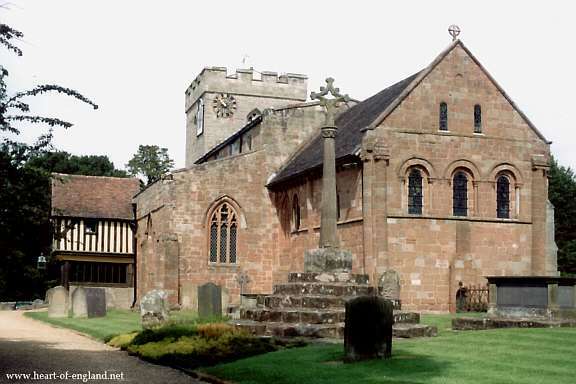 Berkswell Church, the Church of St John Baptist, is built of red sandstone ashlar, and is one of the finest examples of Norman and Early English architecture in the Midlands. The Church is probably built on a religious site that is much older than the Church. The earliest parts of the present church date from the 12th century, and it is likely that this had been a place of worship for some centuries before that. 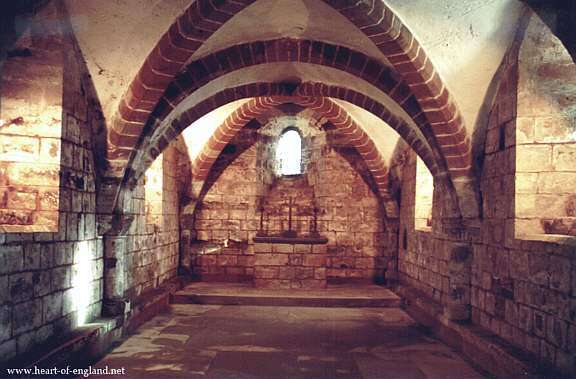 The Norman church has a magnificent crypt in which there is some Saxon stonework, perhaps used as a shrine for sacred relics. The oak font and various other carvings in the church are the work of the woodcarver Robert Thompson, whose hallmark is carved church mice. There are 17 of his mice in Berkswell Church. In the Middle Ages the manor of Berkswell belonged to the Earls of Warwick. The park at Berkswell was originally granted by Henry I to Henry de Newburgh, Earl of Warwick (around 1120), to provide game for hunting. It continued with the Earls of Warwick, until 1557, when it was granted by Philip and Mary to pne Thomas Marrow. His descendant Samuel Marrow built a substantial house of brick around 1670. Samuel Marrow was created a baronette in 1679. His daughter married a Robert Wilmot. Their great-grandson settled at Berkswell in 1808 and carried out major alterations. The house in its present form was built around 1815. The Gentleman's Magazine of 1827 says the hall was rebuilt "10 years since by Sir John Wilmot". Sir John Wilmot became Lieutenant Governor of Van Diemans Land. In 1843 the building was leased to a Rev Bickmore, and used as a boys boarding school. 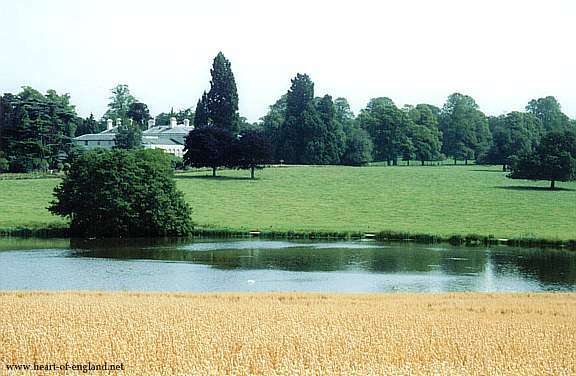 In 1861 it was sold to the iron master Thomas Walker, who made a lake in the grounds. He died in 1887, and in 1888 the estate was sold to Joshua Wheatley, a wool manufacturer from Yorkshire. Joshua Wheatley died in 1925, and the house passed to his son, Charles Wheatley. Charles Wheatley served in, and then commanded the Warwickshire Yeomanry, who held their Summer camps at the Hall. On his death in 1943 the estate passed into the hands of trustees, though Charles Wheatley's widow continued to live at the Hall for some years. In 1984 the house was sold, and converted into apartments. 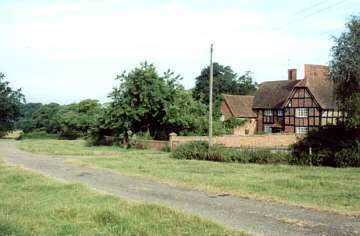 This is Blind Hall Farm, just outside the village. This track is part of the Heart-of-England Way, a 100-mile footpath from the Cotswolds to Cannock Chase. The path here connects Berkswell with Meriden, the centre of England. View across countryside near Blind Hall Farm. 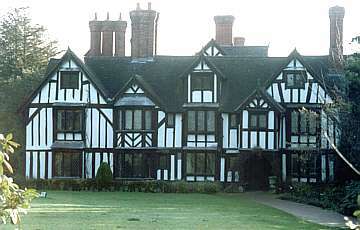 Nailcote Hall takes its name from the de Naylcote family who lived on a farm on this site and of whom there are records dating from the time of Edward III (1327-1377). The hall itself dates from the 1500s. There are various records referring to Goodier Mathew, owner of the hall at the time of the English Civil war. The allegiance of Goodier Mathew is unclear. He is recorded as supplying horses for King Charles, and also for quartering Cromwell's soldiers. The hall then passed to the Lant family. It was subsequently sold to the Wickman company (a local engineering company in Banner Lane) for use for corporate hospitailty, and is now a hotel and restaurant. "The first earl was Arth or Arthgal, of the Round Table, whose cognisance was a bear, because arth means a bear. Morvid, the second earl, overcame, in single combat, a mighty giant, who came against him with a club, which was a tree pulled up by the roots, but stripped of its branches. In remembrance of his victory over the giant he added the ragged staff." 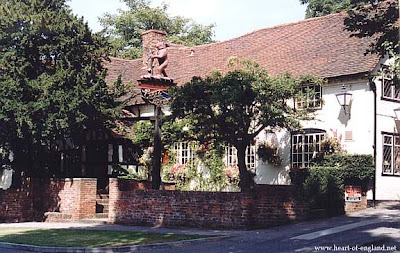 The restaurant in The Bear has been known as Cromwell's room, dating from the time of the English Civil War when Cromwell's troops were quartered in the area. Outside the inn is a gun which originated from the Crimean War, and was brought to the village in 1855. The village has its own small museum. 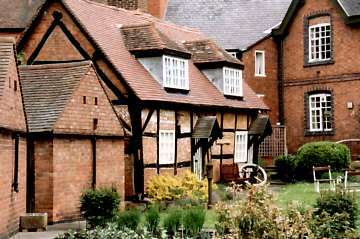 This is an old half-timbered house, dating from around 1500, shown at the left. The roof was originally thatched. The museum contains memorabilia, old farm implements, and various household items. Documentary evidence shows that Oliver Cromwell stationed men and horses in Berkswell before the battle of Kenilworth during the Civil War. 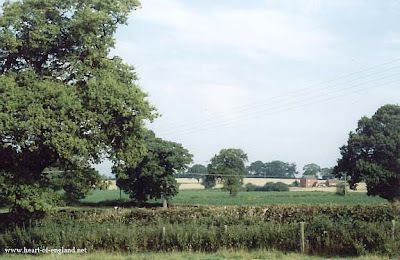 Edgehill and Beyond, by Philip Tennant states that Berkswell was occupied by King Charles and his troops as they made their way from Yorkshire southwards, towards Oxford, at the start of the Civil War, shortly before encountering Parliamentary forces at Edge Hill. The earliest record of a school in the parish is in 1500. In 1887 each child paid one penny a week to attend school. In recent years the school has been completely modernised, but throughout it history it has remained a Church of England school. The Berkswell "Association for the Prosecution of Felons" is one of the oldest in the country. The association was formed because, prior to the establishment of a police force, people were deterred by trouble and expense from prosecuting alleged offenders. 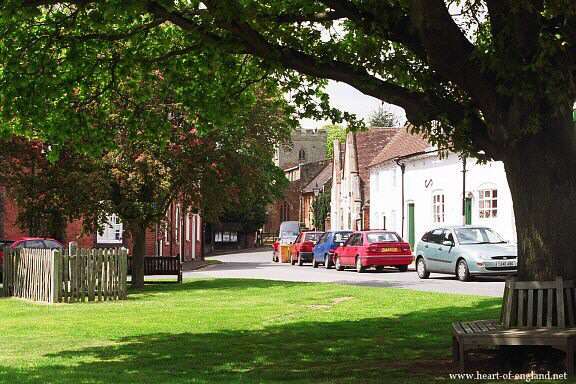 There is a fine set of stocks on the village green. The stocks are curious for having five holes; it is said they were to accomodate a perserse pensioner with a wodden leg and his two boon companions. It is likely that there were originally six holes. There is also a cattle pound. During October the "Stattis" or Statutes Fair was held. This was a hiring fair at which local farmers engaged their servants for the coming year. They met at the Bear Inn. Each man wore, in his smock or hat, the emblem of his trade, a wisp of wool for a shepherd and some horse hair for a waggoner. On one occasion, believed to be the Diamond Jubilee of Queen Victoria, the black cannon, a prize from the Crimea, and now in front of the Bear Inn, was towed to the top of the hill behind the village, charged with black powder and fired. The "Stattis" was discontinued at the outbreak of the First World War. The reading room was opened in 1902 as a meeting place for the "penny readings" which were a feature of rural life at the end of the 19th century. The reading room is now used as a village hall. Mains water and electricity came to the village during the 1930's. On high ground at the south of the parish is Berkswell Windmil. 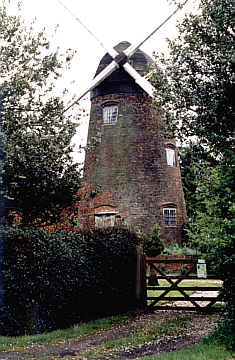 This is a good example of a typical tower mill. It is known to have been in existence since at least 1706. It was in constant use until 1935. At that time a diesel generator was installed to operate the machiney, and that was in use until 1948. The mill has since been restored, by its present owner.